The Palestinian Federation of Unions of University Professors and Employees (PFUUPE) and the Palestinian Campaign for the Academic and Cultural Boycott of Israel (PACBI) urge the University of Cape Town (UCT) to vote in favor of the boycott of Israeli academic institutions in support of our nonviolent struggle for freedom, justice and equality. A vote to sever academic ties with Israeli universities would ensure UCT's campus, faculty, staff and students are free of involvement with institutions that play a well-documented role in, at best justifying, at worst planning, implementing and maintaining Israel's grave violations of international law and our fundamental human rights. It would also send a strong signal to those same universities that principled academic institutions will no longer turn a blind eye to their complicity in Israel's regime of occupation, settler colonialism and apartheid and in facilitating violations of international law. In recognition of the evident collusion of Israeli academic institutions in the denial of Palestinian human rights, and of the power that holding those institutions to account has to effect a change in the stagnant status quo, thousands of academics and important academic associations and teachers' and student unions have endorsed the call by Palestinian academics for an institutional academic boycott of Israel until it respects international law. As you are certainly aware, South Africa has been at the forefront of the groundswell of support for Palestinian rights through our nonviolent boycott campaigns, in particular the academic boycott, with the University of Johannesburg ending ties with Israel's Ben Gurion University. Over 400 South African academics, many from your own university, signed a petition supporting that call, which read, "While Palestinians are not able to access universities and schools, Israeli universities produce the research, technology, arguments and leaders for maintaining the occupation." We want to reiterate that our boycott call is directed solely at Israeli institutions, not individual academics, and that we hold dear the universal right to academic freedom, on principle and because Palestinians are obliged to fight for it every day, along with our right to education. Institutionalised racial discrimination in the Israeli education system is widespread, as manifested in the substantial funding discrepancies between Palestinian and Jewish Israeli schools, which lead to Palestinian citizens of Israel reaching the university at a disadvantage. In all Israeli universities, Palestinian students face not only prevalent racism but also repressive restrictions on political activities. In the occupied Palestinian territory, Israel's web of military checkpoints and apartheid walls turns the simple act of getting to class into a dangerous obstacle course, where reaching one's destination is far from guaranteed. Travel abroad or between the West Bank, including East Jerusalem, and Gaza to advance studies or attend international conferences is made near impossible by Israel's Kafkaesque travel permit system. 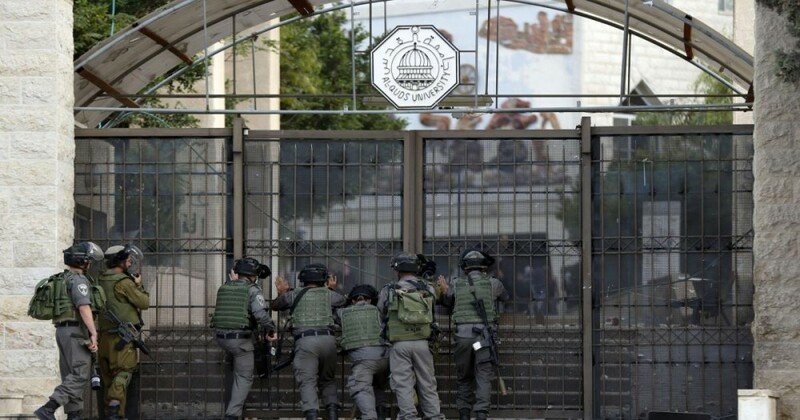 Palestinian universities are at the mercy of Israel for entry of guest scholars from abroad, especially Palestinian refugees who are regularly denied entry. The Israeli military carries out frequent raids on Palestinian universities, where students are forced to dodge live bullets and tear gas. During Israel's 2014 military assault on Gaza, the Israeli military targeted at least 153 Palestinian schools, including 90 run by the United Nations, as well as Gaza's largest university. Palestinian scholars and students living abroad fare no better, facing constant attacks and repression by Israel's influential lobby groups, resulting in courses being suspended, student groups being banned, and faculty being denied tenure, losing job opportunities and being fired. Finally, we wish to express our gratitude to all those on and off the UCT campus, in particular the Palestine Solidarity Forum, for pushing forward with this campaign, and continuing to expand the debate on an issue that is often silenced and stifled. Israeli academic institutions have been given ample occasion to exempt themselves from our boycott call. They need only to meet two simple conditions, recognise the inalienable rights of the Palestinian people as enshrined in international law and end all forms of complicity in violating Palestinian rights as stipulated in international law. To date, not a single Israeli university has met even one of these conditions. We therefore call upon international universities to support our nonviolent struggle for freedom, justice and equality by establishing a non-collaboration policy with complicit Israeli institutions. We urge UCT to fulfill this basic moral imperative by heeding the call of Palestinian academics for a boycott of Israeli universities until we have obtained our fundamental rights. South African expected nothing less when they called for an academic boycott of their apartheid universities. The Palestinian Campaign for the Academic and Cultural Boycott of Israel (PACBI) was initiated in 2004 to contribute to the struggle for Palestinian freedom, justice and equality. PACBI advocates for the boycott of Israeli academic and cultural institutions, given their deep and persistent complicity in Israel's denial of Palestinian rights as stipulated in international law.